This area covers a number of walls and geos and is a 15min walk from the main road and has a real mountain feel about it. Coall Head is south of a bay with two sea stacks in it. 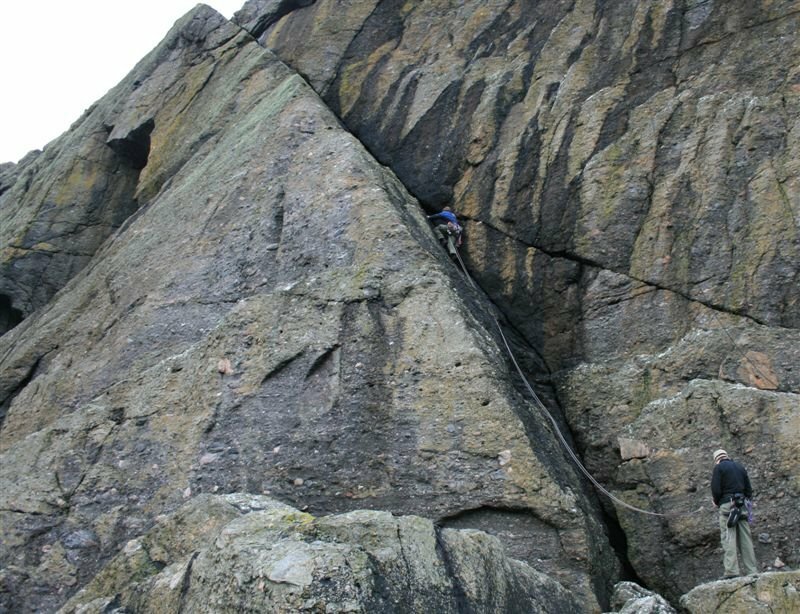 The rock is conglomerate and although not exactly perfect quality, it dries quickly and as a result of this the crag is one of only a few options in Winter. In fact, most of the routes at Coall Head were put up in January and February. For example, Storm Trooper was climbed with force 10 Westerly winds and heavy hail showers! There is plenty of development potential here, but it can be difficult to work out the rock quality until you're committed to the route! No doubt there are a few gems still to be had. A few hundred metres South of Quarff on the A970 the road goes up hill. Park at the top at the side of the road by a gate in the fence. Walk due East across wet ground, reaching the crag after 15 mins or so. Access is by abseil or a scramble down ledges at the south end of the wall. Areas are described from North to South. To add a photo use the uploader in the right sidebar. Make sure you include The Coall in the photo description so it gets added to this page. The rock may look like a conglomerate but is really a breccia, formed from a lithified scree. First explored by me and I hate the place.